What do you mean by Descriptive essay? Descriptive essays are a type of essay writing in which a specific topic or a subject is taken into descriptive consideration. A vivid explanation of that subject is rendered and a perfect description is posted by the writer. Descriptive essay writing is one of the most creative and essential types of essay write up. It is very different from the usual narrative essay, which tends to go for a personal story about the subject. The first purpose of the descriptive essay is to reveal the main idea about the subject and explaining it to the fullest to the readers. A detailed and sensory observation is presented to the readers in a descriptive essay. 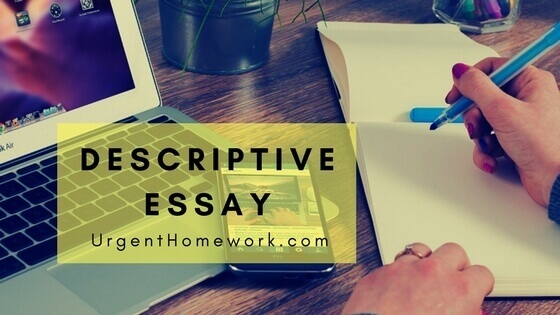 The descriptive essay basically employs the language power and the essential human senses which are mostly required to bring the topic to life. The writer must make the subject such real and not modified, such that the reader relates to the subject in some form. If the reader feels as if he or she have met a person, holding an object, go to a certain place then it means that the writer of that descriptive essay has done a good job. There should be an emotional connection to be felt between the subject and the readers. A writer can describe a person, a place, an object, an experience or even a memory in a descriptive essay. The facts and statistics used in a descriptive essay should be accurate and nicely presented. What is the process of writing a descriptive essay? The first and the foremost step before writing a descriptive essay is to analyze and research thoroughly about the topic. The writer should take appropriate time and resources available to make important points about the subject. The writer needs to analyze what they want to describe and why. It is not necessary for the subject to be unusual or popular. After choosing the topic, the next important step is to procreate the good as well as weak points about the subject. Brainstorming the subject is necessary to get all the points in order. Reflect on the sub details about the topic. Plan out each and every paragraph which will emphasis on the topic understandingly. The second part of writing any descriptive essay is to start creating the initial draft of your work. Lay out an outline, plan out the structure which you are going to follow and implement it in the draft. The main goal; of this type of essay writing is to give the reader a rich experience about the subject. Always show and don’t tell much in a descriptive essay. The reader is always mesmerized when the writer expresses his or her personal accounts also in the essay. ‘Showing’ is an important part of any descriptive essay writing as it enables the reader to feel himself in the details. Use all the senses in the writing and make them useful. A descriptive essay doesn’t depend on facts, examples and samples, but on the writer’s ability to create a mental picture for the reader. The third step of writing a descriptive essay is to revise your writing thoroughly. The revision phase is a very crucial phase where the writer should modify, review and reorganize the essay as suitable. The goal should be to make the essay best it can be. There should be some important considerations while revising the descriptive essay. Does the essay portray the subject well in good structured format or not? Does the subject is fully appreciated in a manner which helps the reader in fully understanding the subject? Are the paragraphs confusing or incoherent or not? Does the word choice involve all the five senses and convey proper emotion or not? Are there enough details to give the reader a complete picture? Is the meaning of the description and the subject’s nature well understandable to the reader or not? All these points should be dealt with care and revisions should be made according. The conclusion which is drawn at the end of the essay should be clear and concise for the reader to understand easily. A descriptive essay must be to the point in its detail, yet not get ahead of itself in explaining. It’s better to go from the general to the specific. This is the most important part of writing the descriptive essay. The writer has to proofread his writing and correct any errors which might occur grammatically or in sentence structuring. Editing is the phase to improve the clarity as well as the style of the essay. Remove if there are any clichés. The best way of editing is to make your friend or any relative read out loud the essay. The trouble spots and the tone of the essay can be identified easily with the readout. The fifth and the final step of writing a descriptive essay is to publish your essay without any confusion or under-confidence. Be confident about your topic and the details which you have included in your writing. The writer needs to have the sufficient insight about the topic and should answer any questions at the end of the essay presentation, about the topic. Make sure to not lose hope even if the writing fails.